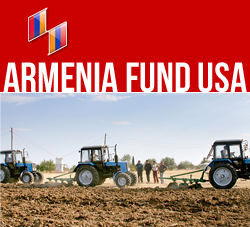 NEW YORK, New York — Armenia Fund is continuing its healthcare initiatives in Armenia and Karabakh in 2012. The implementation of healthcare initiatives in regions across Armenia and Karabakh has always been a main focus of Armenia Fund's. Now with more water being brought to villages across Karabakh, the building and renovating of healthcare facilities will be met with greater success in 2012 and years to come! The construction of a brand new hospital in the town of Martuni is well on its way and is expected to be completed in 2012. The new facility will be able to treat close to 1,000 impatient and 1,400 ambulatory patients on a yearly basis. This will mean great things for the residents of Martuni and the surrounding villages. In December of 2011, the Fund completed the reconstruction of Kapan Town Medical Center's pediatric department. The department has undergone a complete makeover including a full hydro isolation, which will ensure a clean and sterile environment for the patients. It is expected that the number of doctors and support staff will increase from 15 to 25, and the department will be able to serve up to 600 to 650 patients annually. Every healthcare facility Armenia Fund builds or renovates is complete with new heating, water, sewerage and electric systems, which are all mandatory components of a healthcare facility. With hospitals being established in both Kapan and Martuni, these 2 strategically located facilities, as well as other smaller quick-care centers throughout the regions, will be vital to the residents of surrounding villages who will now have access to improved healthcare treatment. Once the actual structures are built and all water and heating systems are in place, new state-of-the-art equipment and medicine can be delivered to the healthcare facilities, as well as training programs for doctors and medical staff. It is such that each project completed allows another project to be born. Providing world-class healthcare in Armenia and Karabakh is the goal, and every step made in enhancing all healthcare amenities, from establishing 24-hour running water to delivering modern medical equipment, will ensure a greater degree of success in the treatment of patients. Better hospitals mean better care, and better care means healthier, longer and more productive lives for the residents of Armenia and Karabakh. Martuni Hospital project is co-funded by Armenian Medical Fund and the Government of Karabakh.